I made this card several days ago for a friend's birthday and am just now getting around to uploading it. I really love this stamp set from There She Goes. The birds and trees are so much fun to color and those sweet little birdies are so durn happy just walkin' a long and whistlin' Dixie! In this case, my birdie is whistlin' Happy Birthday to my friend. The little flowers and grass are stamps from the Kittie Kits Cause A Scene set distributed by Rubbernecker. And that cute polkadotted brad came with a package of fun brads my dear friend, Traci, gifted me. I paper pierced around the edges so I could make my faux stitching with a black marker. I hope you're having a Happy Day today! Each of us makes it what it is. This is just sooo adorable, Charlene!! Love how you colored those leaves! Amazing!! Adorable card, Charlene! I love to see red and green together for non-holiday projects! Too cute! This is such a "happy" card!! I smiled when I first saw it...I love how you incorporated the Kittie Kits Cause A Scene ! Well done ! Charlene this IS a fabulous imaeg! LOVE this tree and how you colored it and the little bird just grabs my heartstrings! Love your color combo... just so fun! Thanks for stopping by my blog too! Hugs! Oh Charlene....This is too cute!! I love your birdie!!! The tree is colored gorgeously. Every time I come here I see more stamps I need to get. I think I may go broke. Adorable and gorgeous work!! Perfect, I lvoe those colors. 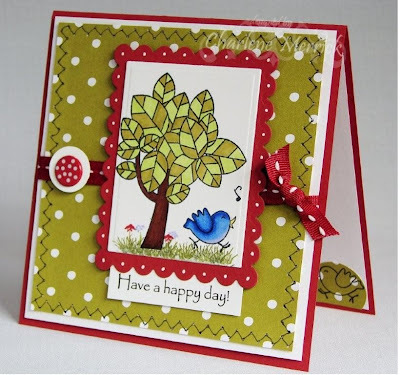 Love love love this birdie and the cute scene you created with the Kittie Krafts! Such a fun happy card, sure to make someone's birthday even happier, Charlene!! This is beautiful Charlene!! I LOVE the colors and the fun dp you used with those darling images!! Fabulous!! Oh my goodness!! This is just darling!!! Loooooove your coloring on that sweet little blue bird! I love that stamp set, Charlene...it makes me happy just looking at that sweet little bird!!! Love your coloring, too, and the awesome layout!! !